The gentle vibrations from my iPhone slowly cut the last thin thread of dreams separating me from consciousness as I pulled myself awake. Looking at the gaps in my tent wall showed just the faintest tint of color lightening the morning sky. 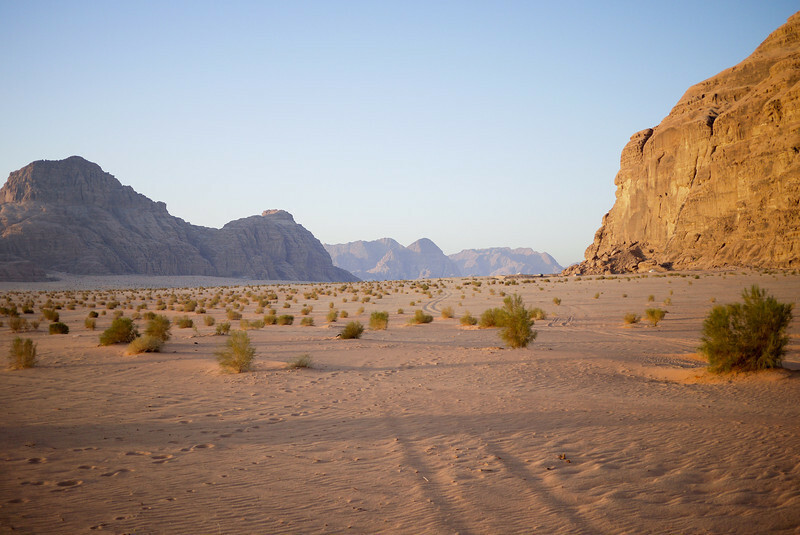 The dead silence surrounding me at the desert camp in Wadi Rum, Jordan invited me to curl back into my heavy blanket and claim another hour of sleep – 5:00am seems barely human for a wake up call. My iPhone was on to me though, and just as my eyelids drifted closed the alarm’s insistent buzzing woke me once again. Oh yeah, how could I have forgotten? A sunrise camel ride through the desert! The pleasant thought of camels was enough to propel me to my feet and, still clad in my pajamas, I added clothes to my ensemble with hopes for warmth in the cool desert air still clinging to the vast open spaces. The tent camp was eerily silent and as I rounded the corner Jodi effortlessly matched my pace from her tent. 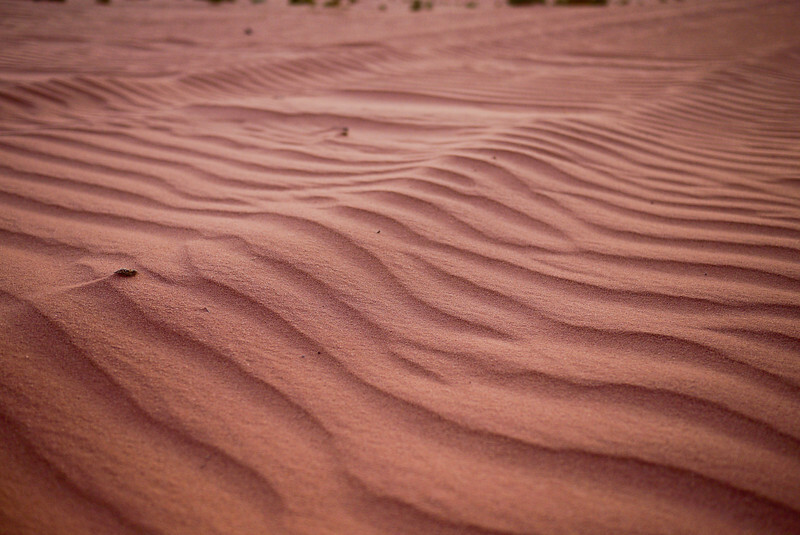 Both silent, we walked; it seemed unnatural to break the pin-drop silence of the desert at dawn. As we exited the tent camp we were greeted with four camels resting in placid contentment on the ground. Without much fanfare Shabula, our guide, sized us up and gestured to our trusty steeds for the next hour. 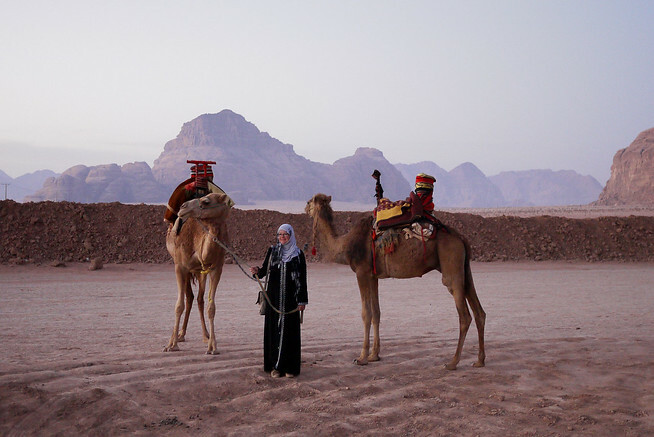 Jodi, the more petite of the two of us, would ride Zachaiha, a pregnant and well-tempered female camel. My camel, Zachi, is a young male nearly ready to be sold because he’s now old enough to threaten the virility and dominance of our lead’s male stud camel, Zaki. Another traveler, an Australian woman living at the desert tent camp, joined us and within a moment the four camels took their cues and ungracefully jolted into a standing position, their long legs causing an awkward movement that first thrust me forward full force before a rapid whip backwards, and then upright into riding position. Shabala took the reins and set the pace as we eased ourselves into the faded orange sands of dawn. The far-reaching sand was pristine at this hour. 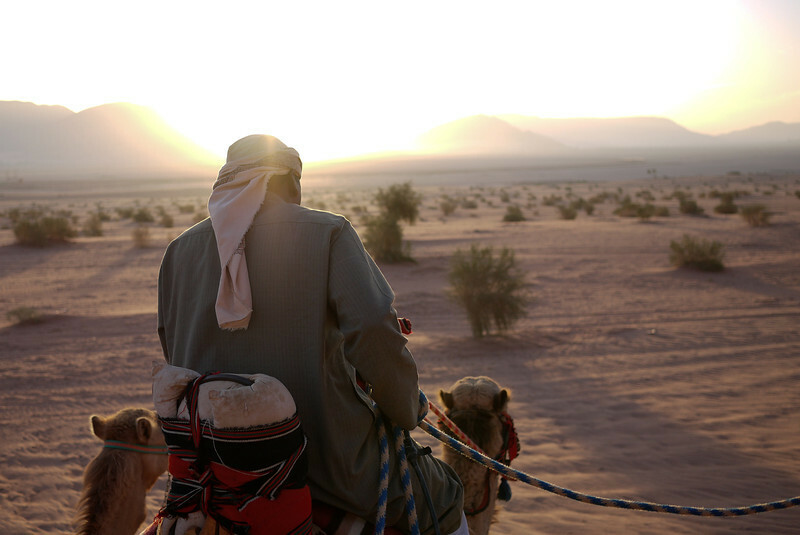 The gentle nighttime breezes had removed all traces of humanity and the desert sands became a blank canvas for our sunrise camel ride. The morning stillness was absolute. Dusk is often a riot of activity; back home the cicadas assert their presence with insistence throughout sunset, mosquitoes hum, and the last moments of daylight are often aggressively seized by nature. But sunrise? Sunrise is a softly quiet affair. 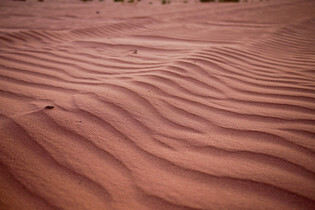 Few are up at this hour, animals and humans alike, and our camels took a plodding pace, stopping for grass snacks at their leisure as we watched mother nature’s pastel paintbrush slowly change our surroundings. The shadows and grays of pre-dawn slowly gave way to subdued tinges on the orange rocks. Within five minutes subtlety left as pastel pinks, blues and oranges tinged the rock and dessert landscape for hundreds of miles around. Light bounced off the far corners of the mountains. Our camels, oblivious to the concert of colors, continued moseying while we were left awed. Inspired by the quiet pleasure of watching the desert landscape painted by a seemingly simple sunrise left a feeling of contentment and happiness that carried over throughout my day. I so easily to forget to take those needed moments to recharge and step back from life. 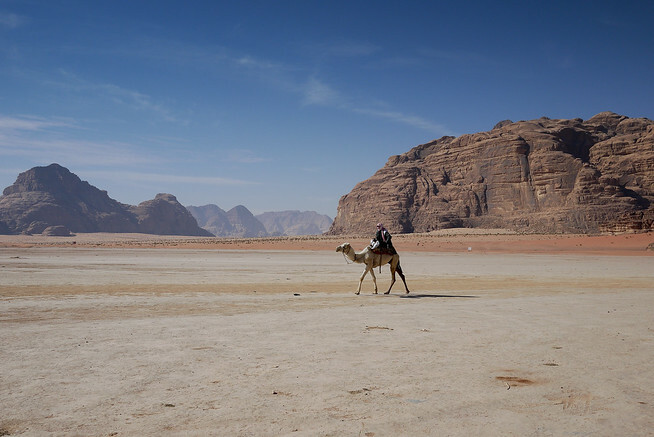 An hour spent wandering the deserts of Wadi Rum on camel was just the antidote I needed for a gentle jolt of perspective and creativity. This is such a beautiful description! 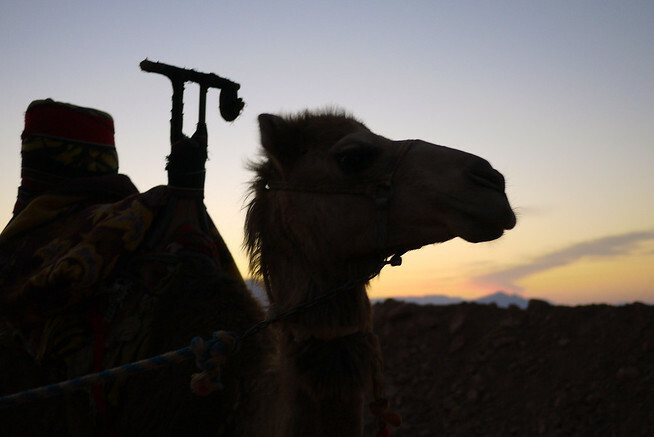 I went on a camel ride through the desert in Morocco a few years ago and I also distinctly remember how awkward the camel was, how jerky it was when it stood up, the rolling stride. I am so in love with the desert. Being brought up in El Paso, Texas, I can appreciate it’s raw beauty like no other. Pics look amazing and so does the adventure! 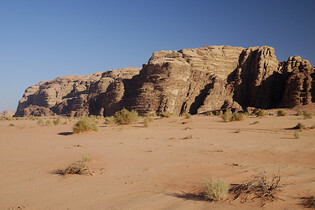 Never heard of Wadi Rum before but they way you descibe the sunrise and the photos makes it a place to want to visit. How did the pregnant camel do? Is its safe for her to be doing tours while pregnant? I bet it was amazing! As much as I hate waking up early (or rather, as hard as it is) I find that the early hours are so peaceful. I enjoy taking an early morning jog just to avoid the crowds and pollution. It’s so much easier to breath and just enjoy nature when the sounds of the city are quiet. I’m reading this as I just woke up and truly love your descriptions and images. I can see how this would be a truly wonderful way to start a day. Thanks for sharing these experiences so beautifully! Beautiful Post Shannon.Wadi Rum is gorgeous and there is no better place than here to do a camel ride. Definitely worth waking up for. Lovely post and photo essay! I briefly visited Jordan a few years a go and although I got only a little glimpse, the country has remained on my ‘radar’ since then. Now, you’re make me feeling that time has come to start thinking at a new, longer tour… Looks like you had a wonderful time!